Those 365 days, plus 2 in Vietnam was a time to remember, a land of two seasons and two weathers; wet and dry, mud and dust; humid and hot that was evenly split from wet to dry. The wet and mud I could hack, but the dry and dust were a pain in the eyes, the nose, and the throat while operating areas of nothing else but that. The stars shone brightly above during the wet season, and when the dry came there was nothing but a haze that covered the heavens at night, but during the day the smell and the haze of death lingered long. During the wet, you were wet, wet all the time through sweat, and tears, and rain. During the dry the dust got into everything between your crutch and the cheeks of your arse; and it covered everything from top to bottom, in-between, and all around. It was in everything. They pumped us full of pills, that they claimed were going to save our lives, but those so-called safe anti-malaria pills did more damage than good; then some of the blokes (Wayne and Bill) got dysentery, how great was that, as another pill bigger that a bicycle wheel was added to our list, and to make things even worse we were confined to our hill for another 28 days. Those toilet runs were many and that kept us empty. We kept taking those pills for diseases we did not have and possibly weren’t there. They pushed us hard, making sure that we all had taken our drugs, and even they knew that the “Dapsone” was doing more harm than good. Yep, we were nothing more than guinea pig and with a short-fused “use-by-date for some whose health deteriorated. Then those mosquitoes that loved the sweet blood of the white-skinned, “round-eyes”, but the good old Bundaberg Rum, and Johnny Walker Whiskey (Black Label) was the answer to all those bloody mozzies. But, I was one of the lucky ones, because I discovered that “A” Positive blood was a blood they disliked. Then payday came, and you would all line up and collect any extra drug and your monopoly pay called MPC, which had a very good exchange rate in town. Then the bloody plastic sandbags that replaced the hessian ones appeared on the scene. I always wonder how many of those bastards did I fill with our diggers of our troop. Thousands I guess, and John Healey held the record. Those sandbags were our friends, and they had a purpose to protect, but our diggers complained continually to Terry and me. Those good old hessian sandbags were of a good quality, but those plastic ones slipped all the time while trying to stack them in an even line, unstable and bloody nuisance as they continue to fall in all directions. Yes in those days, when things just happen, a helicopter falls out of the sky at the airfield amongst the ground crew on the ground, flames explode all around, and so far away but still vivid in the memory of that day. Then a Caribous, full of star pickets, begins its take-off from the airfield and begins its normal ascent heading toward our hill and over our unit. As it heads toward us, the LH motor fails and it begins to lose altitude, heading directly towards us and our unit area. The brave pilot turns his disabled aircraft into the dead motor, and it falls out of the air before your very eyes and disappears below the clear water of the swamp. The pilot survives, but sadly his co-pilot didn’t. Yes, life was so simple and so quick that even a blink of an eye can record such things with a memory hard to forget. The memories of seeing a 250lb bomb exploding in the Long Hais, and not seeing an American fighter bomber in sight, and then you hear the dust off siren in the distance, and the dust off chopper coming in. So sad, when the smoke clear, 3 killed, and 13 wounded from a remote bomb ambush. The day I heard that Mick was killed in May of 69 was a sad day, but I celebrated Ray’s VC in October in Saigon, as Ray was awarded the VC for trying to save Mick. Then I became concerned of Sig Moore’s health and noticed the swelling of his fingers and sent him to the RAP to get checked out, he was medevaced quickly and a few months later he died from cancer. Then to make matters worse, the Postmen went on strike and refused to handle our mail, I didn’t receive a letter from my wife for nearly two months, so I was glad to “Punch a postie on R and R!” Then the waterside workers went on strike and refused to load the Jeparit, the navy stepped in and manned the ship. That was great, because our unit cook had a friend on the Jeparit and he would give us some good old Aussie snags and boxes of four-and-twenty pies, but we did miss the good old Aussie milk shake. When we returned home in the dead of night, midnight in my case, hidden from the public view and moratoriums and the Save Our Sons Organisation, we milled around the airport foyer to receive our pay. We slept in the chairs at Mascot airport for the rest of the early hours of the morning waiting for our airplane home at 7:30AM. Yep, we even had to pay for our airfare in preference to an all day wait in Sydney and then the snail train to Melbourne. I can assure you all that I wanted to do was to get home as quick as I could, and willingly paid the difference between the airfare and train fare to Melbourne, to see my family once again, and to begin to rebuild my life. As I waited in the foyer, all the civilians began to arrive and milled all around us. I smelt under my armpits, because I couldn’t understand why there was a circle all around us. Such pains when they wouldn’t look us in the eye; wouldn’t talk to us or say: “Welcome home digger”; they ignored us as if we were the “untouchables”; those cowardly baby killers, rapists, and murderers that all knew so well on the TV. Then the readjustment to living a normal life began, driving down the wrong side of the road, flinching when you hear a car bag fire, having fingers pointing at us, and blaming us for all what was going on. We were told not to wear our uniforms and if we did wear our uniforms we weren’t to wear our war ribbons. Those other images of the war I have not explained, many still familiar of the smell of death, as you hear the news a friend was killed, and of another brave bloke who raced out into the open field of withering fire to save him, but only to die in his arms. 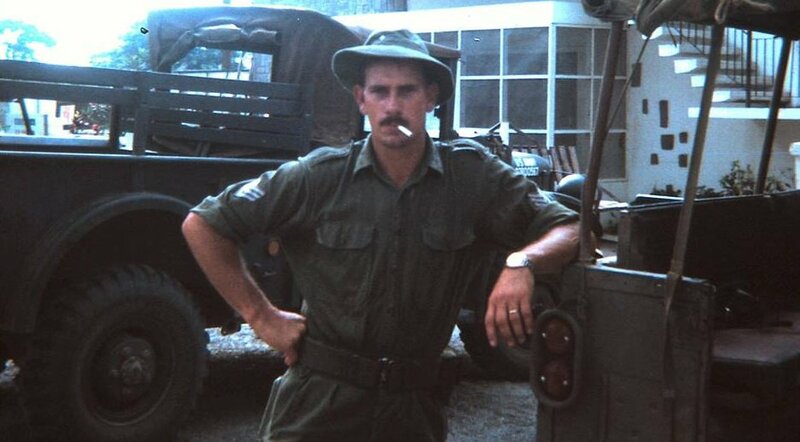 Yes that bloke received a VC, but who cared at home about this incident, all they wanted to hear was about the My Lai massacre, and the execution of a VC officer in Saigon TET Offensive in 1968, which made the public opinion and understanding of their young fighting soldiers, NSMs and Regulars, a crying shame. We were not looked on with respect or recognised of the great job we did in our Province. The Australian public didn’t know anything about our approach to the war, which was totally different to the Americans; we treated the people with respect that we could muster at a time of war. We had to win their respect, and I believed we did. The enemy respected the Australians, because we buried their dead. We were abused as baby killers, rapists and murderers, some had blood and urine thrown over them. They didn’t know that we fought with more humanity and professionalism than our American counterparts. Many had seen death, lost their mates in combat, and the worst of all to kill another person, and we did our job, but we let those Vietnamese people down in Phuoc Tuy Province, and we left them to the pain of torment, torture and death when advancing NVA forces arrived. They loved us then, and they still love us today. Many other RSLs in the cities proved less than welcoming to us, whose members were from earlier conflicts, who labelled us as not being a veteran of war, even though many of our mates were suffering PTSD, they just didn’t want to share their comradeship and understanding of fellow veterans. But, the rural community were more open and accepting to their brothers of the bush who were returning home from war. We did harbour much resentment of our rejection by Australia, and in 1987 with all of our hurt, offence, and rejection we passed it all over to our God, as we all marched down the streets of Sydney, receiving that “Welcome Home”, twenty-five years later, and twenty-five years too late for all those who died on the battle field, from illnesses of war and had taken their own lives. Then in 1992 we were given another bonus, our own Vietnam War Memorial. But, the pain and hurt is a thing that we can forgive, but it’s the hardest to quell at times when our wobbles set in as those burning hurts and memories of those times of so many good men who died in vain, for nothing. We didn’t lose a war; it was already lost it from day one.